In 2004, Clint Ruesch tried meth for the first time. He called the experience four days of madness and mayhem, and he could see the drug had the potential to ruin his life very fast, so he didn't touch it again. At least not until the end of 2012, that is. What followed was a nine-month spiral of near daily use punctuated with multiple attempts to quit. "When you take a substance with as high a level of dopamine as meth, it grabs you hard on a primitive level," he said. "People don't understand that there's a change in your brain that escalates it." Ruesch isn't alone. 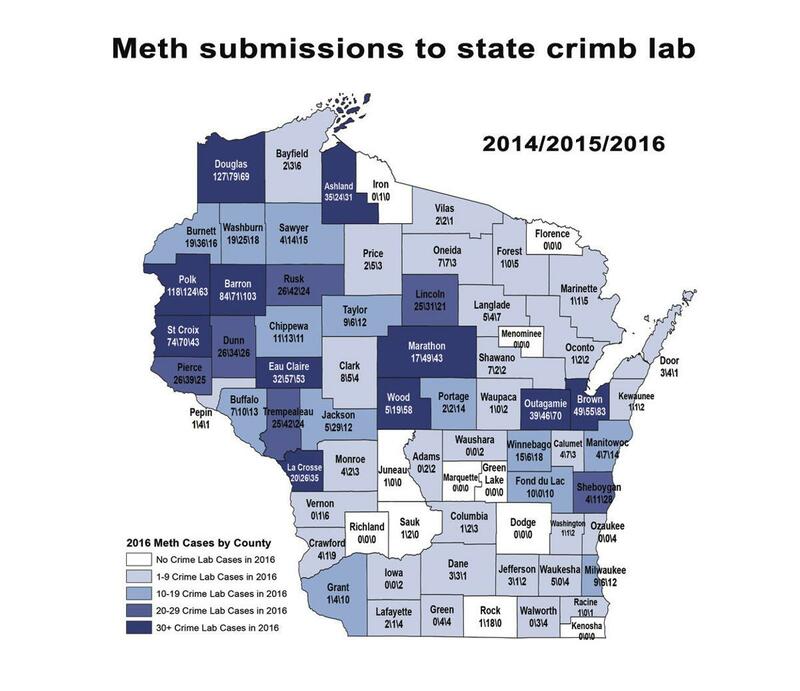 Despite years of community and law enforcement efforts across Wisconsin, methamphetamine use continues to grow. According to a new report, 2013 to 2017 saw an estimated 167-percent increase in people testing positive for meth as part of job-related screenings throughout the Midwest, including Wisconsin. In 2015, meth use cost Wisconsin $424 million. Graph from the Wisconsin Department of Justice. That rise has Attorney General Brad Schimel introducing the next phase of the "Know Meth" public awareness campaign and adding $225,000 in new funding. The campaign will run targeted prevention ads in more than 35 counties in northern and western Wisconsin — including Wausau, Green Bay and Appleton — beginning in late June and early July. The ads will include online, television, video, radio and print materials. Meth use ebbs and flows, said Melissa Moore, Drug Free Communities program coordinator in Marathon County. But it has remained an underlying problem. It tends to be an issue, be replaced by another drug, then make its way back, she said. Dr. Chris Eberlein, an emergency physician at Gundersen Health System based in La Crosse, agrees. "Statewide and nationwide, meth has not left the rural communities," he said "I think maybe it just got pushed aside because of the opioid epidemic we’re having, but it’s been there all along." Those inconsistencies have to do with supply and demand, Moore said, and you can see meth making it's way east across the state by way of the Twin Cities and before that, Mexico. People don't start with meth, Moore said. They start with what's widely available in their communities: alcohol, tobacco, marijuana and prescription medication. And when reports like this come out, it's tempting to pick on that drug, but that's always changing and there's more to the story, Moore said. "It's important to remember that alcohol is the number one issue in Wisconsin communities," she said. In 2012, excessive alcohol use in Wisconsin cost $1,200 per person in higher taxes, health care and other costs. Ruesch, now a recovery coach who helps others struggling with addiction in his hometown of Wausau, started abusing drugs and alcohol when he was a teenager, and went into treatment for the first time before he was 18 years old. He started with alcohol and marijuana, moved into cocaine for a brief period and had bouts with various drugs. "It didn't stick," he said of receiving treatment. "But I was aware of my issue and tried to basically manage it, though the thought of giving up drugs and alcohol forever was a difficult concept for me at that age." When he was 34 he got a prescription for Adderall, which he said he abused for about four years before he lost his prescription. Ruesch knew people who had connections to meth and he quickly started using it almost every day. "I would say I was going to quit everyday," he said. "The first two days (without meth) are depressing, by the third day I felt like I wanted to put a bullet in my head. That made it really easy to just do it one more time." That's a very common theme among meth users, Eberlein said, and over time tolerance builds up so the same dose doesn’t have the same effect. "They get the initial high, it wears off, they get very tired because they’ve had that stimulation and probably been up for a long period of time at that point, and then to function, they take more," he said. Methamphetamine is a stimulant, meaning it can cause rapid heart rates and very high blood pressure. Long-term use can also cause severe and premature aging of the cardiovascular system, leading to heart attack and stroke. "On high blood pressure medication, we’re trying to protect the blood vessels from that constant elevation and pressure … methamphetamine abusers are doing that via pill, increasing their blood pressure to dangerous levels frequently by taking that drug," Eberlein said. Ruesch's meth use came to an end in September 2013 when he was in a car accident. He wasn't on meth when it happened, but when the police officer saw his record, he was taken to the hospital where they found trace amounts of the drug in his blood, he said. He was charged with his fifth OWI. A lawyer told him he could avoid prison because his blood tests proved he hadn't used meth the day of the accident, but he was also offered a treatment course at the same time. He chose treatment and spent seven months in jail before going to an OWI treatment court for 13 months, the minimum amount, which he completed without any setbacks. He was also the first person in Marathon County to be accepted to the course for meth addiction. "I accepted the treatment course and it saved my life, not just from meth, but alcohol and other drugs," he said. "I shut my mouth and did what I was told, listened and accepted the help." Clint Ruesch with his children in 2017. Photo courtesy of Ruesch. Ruesch said he was considered a "functional addict" — he supported his five kids, paid his bills and worked. But he lived a dysfunctional, secret life, living paycheck to paycheck and always high. In the end, Ruesch's meth addiction from December 2012 to September 2013 cost him between $10,000 and $12,000. But treatment can be hard to come by, Eberlein said. There isn’t the medication-assisted treatment available to heroin and opioid addicts. But similar to opioid addiction, treatment facilities are somewhat limited and expensive. Like all drugs, prevention is the most effective way to control illegal substance use in communities; once it’s there, it’s very difficult to combat. But knowledge about prevention is lacking, even when compared to opioid prevention, he said. "We know that 80 percent of heroin users started abusing prescription opiates, so we can really target those prescription opiates," Eberlein said. "We don’t have that correlation yet (with meth), as far as with other medications and drugs we could look at that are perhaps are playing a role. So from that standpoint there’s a lot more work that could be done."